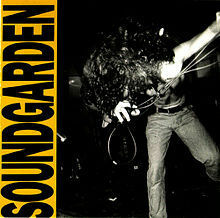 Louder Than Love is the second studio album by the American grunge band Soundgarden, released on September 5, 1989 through A&M Records. After touring in support of its first full-length studio album, Ultramega OK (1988), Soundgarden signed with A&M and began work on its first album for a major label. The songs on the album featured a heavy metal sound with some songs featuring unusual or unorthodox time signatures. Because of some of the song lyrics, a a Parental Advisory sticker was placed on the album packaging. The band faced various retail and distribution problems upon the album's release. Louder Than Love would become the band's first album to chart on the Billboard 200. The band supported the album with tours of North America and Europe. It was the last Soundgarden album to feature the band's original bassist, Hiro Yamamoto.